You are currently browsing the archives for the Fireplace Accessories category. Over the centuries, as metalurgy skills progressed, the heat of the forge was intensified by the use of bellows. Fire requires oxygen and air in order to burn. A Vintage Style Bellow is a perfect fireplace accessory for use today. The added air flow, directed at the kindling or burning coals, stokes the flame for a hotter and quicker burn. 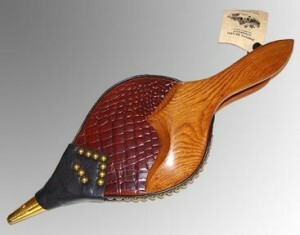 Bellows come in a variety of styles, materials, and finishes. There are models suitable for any decor. These provide a great decor accent, and make a functional tool for any wood burning fireplace.